First time owners express surprise at the friendliness and curiosity of Cubalayas. Chicks will eat from human hands at birth. They have little fear of anything. In fact, older and wiser members of the flock have to teach chicks to run from predators. Cubalayas, although noisy, possess a calm disposition. The hens brood easily and make good mothers. Roosters will fight if left together. However, they seldom show aggression toward humans. Cubalayas combine the best of Asiatic and European game fowl to produce a truly spectacular ornamental. The stunning Black Breasted Red Cubalaya has a jet black body with contrasting bright orange shackle and shell feathers ending in a distinctive “lobster tail.” Lobster tails, unique to Cubalayas, slant down twenty degrees rather than up as in other breeds. The large, solitary, lobster-tail feathers follow the contour of the body with their final termination on the ground. Cubalayas come in many different colors; however, only the White, Black, and Black Breasted Red have found their way into the Standard of Perfection book kept by the American Poultry Association (APA). The Silver and Gold Duckwings and the Blue Wheaton have yet to meet APA standards. Cubalayas need to forage. Build a spacious run for your flock and move it often to avoid parasite infestation. Keep roosters apart or the game bird part of their character will display itself with dire consequences. Bred from warm climate fowl, Cubalayas tolerate heat and humidity well. Conversely, they have little tolerance for cold drafty conditions. If you live in the northern latitudes, insulate and caulk the coop. 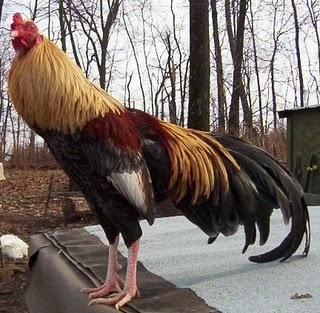 Americans appreciate the incredible beauty of the Cubalaya and may miss the practical egg laying qualities of the breed. Feed them good layer food and supplement the morning light in the winter months, and they will provide you an egg a day.